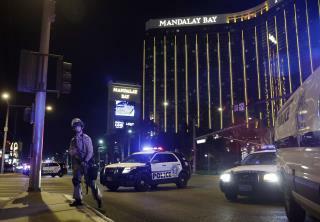 (Newser) – President Trump on Monday called the mass shooting in Las Vegas Sunday night an "act of pure evil" and said he would visit the city to meet with victims and first responders on Wednesday, reports CNN. In a brief news conference, Trump also praised the response by police and medical personnel as "miraculous" and credited it with preventing an even further loss of life. "It is our love that defines us today," said Trump, per the Washington Post. "Our unity cannot be shattered by evil, our bonds cannot be broken by violence." Wowza! Bump Stocks are friggin COOL! Had no idea they even existed. Next week, the GOP is planning to make silencers for guns legal. That "crowning accomplishment" will guarantee more gun profits and DEATHS.